My cast iron grill pan has been getting a lot of use this summer. We don't own a real grill, so we have to make do with the grill pan until we move somewhere with outdoor space. Luckily, the grill pan makes nice grill marks and actually imparts a pretty decent smoky flavor. It's perfect for recipes like this (although of course, if you have a real grill, you can definitely use it!). 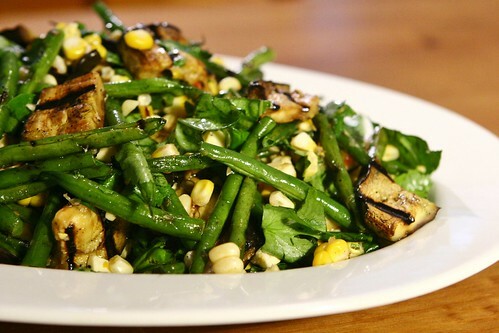 Here, eggplant, corn, and green beans get grilled to perfection and tossed with handfuls of herbs and a zingy Malaysian vinaigrette. The dish is simple and super flavorful, and takes advantage of summer's wonderful fresh veggies and herbs. p.s. My blog turns two years old tomorrow! Unfortunately, I don't have my act together enough to plan and write a special post for my blog's birthday. So I'll just say yay! Happy birthday to Four Seasons of Food! Thank you to everyone who has stopped by, commented, or tried one of my recipes. You keep me motivated to continue posting, and I hugely appreciate your support. I'm giving instructions for using a cast iron grill pan on the stovetop, because that's how I made the recipe. You can certainly use a charcoal or gas grill if you have one, although the timing may be different than what I write here. Also, feel free to experiment with other vegetables if you'd like. Keep the eggplant in though - it gets such great smoky flavor after being grilled, and works beautifully with the vinaigrette. Heat a cast iron grill pan and grill press over high heat, and brush with oil. Place green beans on grill pan and cover with grill press. Grill until crisp-tender and charred in spots, about 8 minutes, turning beans occasionally. Transfer beans to a cutting board. Place eggplant slices on grill pan and cover with grill press. Grill until tender but not mushy, about 5 minutes, flipping slices once. Transfer eggplant slices to the cutting board. Place corn on the grill and cook until charred in spots, about 10-15 minutes, turning often. 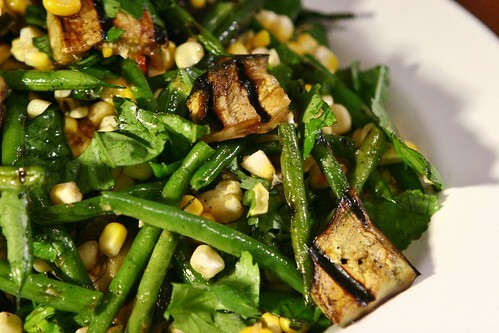 While corn cooks, cut green beans in half lengthwise and cut eggplant into 1-inch pieces. When corn is finished grilling, cut kernels from the cobs and transfer all vegetables to a large bowl. Using a mortar and pestle (or small food processor), mash together garlic, brown sugar, chile pepper, and a pinch of salt until a coarse paste forms. Stir in fish sauce and lime juice. Drizzle dressing over vegetables and add herbs. Toss together well. Serve warm with rice. I love a good summer recipe that involves corn! Even better if it also has fresh herbs!! I hear you on the cast iron skillet/grill pan. I can't wait til we are able to have a grill, but that works for now. Your veggies look great - a perfect summer mix. Happy blog birthday, too! I think I majorly need a grill pan because this sounds like something I need in my life! All those veggies with that awesome dressing...swoon. Happy two years love! That's quite an accomplishment! That vinaigrette sounds so fresh and wonderful! yay for a fabulous two years :) this salad certainly looks worthy of a celebration!! A belated Happy Blog Birthday to you! The vegetables look amazing. I love your pictures!